At some point, you may need to export content from your site at http://blogs.baylor.edu to another WordPress blog. For example, you may be graduating and wish to take your e-portfolio contents with you: This is a perfect occasion to use WordPress’s built-in export tool to transfer your site to another free blog hosted at http://wordpress.com. Leave “All content” selected if you’d like to take all of your content, including file attachments, with you; otherwise, select any of the other options as appropriate. Click the “Download Export File” button and save the file to your computer. 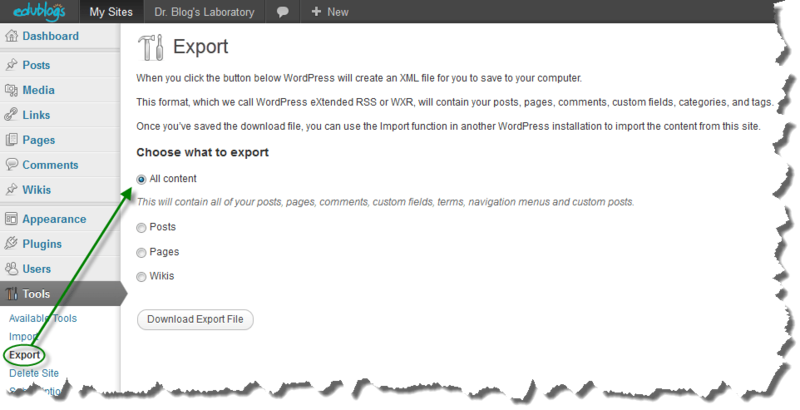 Once the export file has been downloaded, you can follow these instructions for importing content into another blog at http://wordpress.com. Be aware that there are often some limitations with regard to how large an export file can be, and the site from which you are exporting must be accessible over the Internet in order for attachments (i.e., images and documents associated with your account) to import into the destination site. Learn how to update your site to avoid deactivation during our spring cleaning .